Neural circuits display complex spatiotemporal patterns of activity on the millisecond timescale. Understanding how these activity patterns drive behaviour is a fundamental problem in neuroscience. To address this challenge, we have recently introduced a novel approach that combines simultaneous two-photon calcium imaging and two-photon targeted optogenetic photostimulation with the use of a spatial light modulator (SLM) to provide 'all-optical' readout and manipulation of the same neurons in vivo. 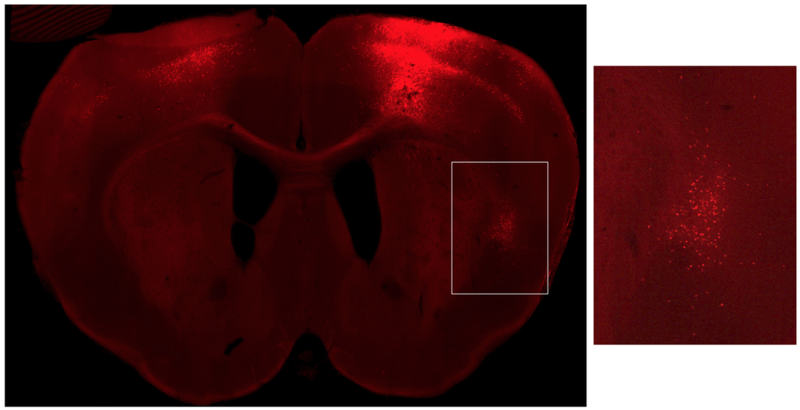 We probe the neural code in mouse barrel cortex during sensory-guided behavioural tasks by using this approach to uncover the underlying mechanisms of decoding and encoding of information by ensembles of neurons. We train mice to make perceptual decisions based on quantitative control of cortical activity, as well as perturb neural activity in neocortex while animals are performing discrimination tasks. These experiments shed light on how neurons with differing functional signatures subserve perception. How does the brain integrate inputs from the environment to generate perception and drive decisions? An enigmatic brain region called the claustrum has been suggested to play a role by integrating inputs from multiple brain regions. There is strong interconnectivity between claustrum and nearly every neocortical brain region, indicating that it exerts widespread influence on brain function. However, approaches to specifically record from or manipulate activity in the claustrum have been hindered by the inability to target it selectively. This has been difficult due to the anatomy of the claustrum: it is a long, thin bilateral nucleus buried between the neocortex and the striatum. Our work aims to understand the role of the claustrum in multisensory integration and behaviour by developing new approaches for monitoring and manipulating the activity of the claustrum. We harness recent advances in electrophysiological, genetic, optical, and behavioural tools to probe its connectivity, activity, and function in a precise manner.